I am writing this statement before I listen to the album again for the first time in a very long time: There was a time eons ago, when I thought that Gasoline Alley was the best album ever. Man, does this album crackle. This is Rod Stewart. This is Rod Stewart. This is Rod Stewart! This is what he should be doing. That English blues with a slight country flair. 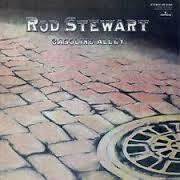 As a matter of fact, Rod Stewart should do a Gasoline Alley tour and stop croaking out songs he shouldn’t be singing that are like nails on a chalk board. Just songs from this album (and a few from some of my others – I’ll pick), and if he tries to do anything like what he’s been doing for at least the last 10 years, he should seriously consider putting a sock in it. I’ll come to see him, and I’ll bring a date. Now this is not a great workout album, however it’s a real pleasant one, and has therefore earned an enthusiastic spot on the Ram alternative list. And to think, I was nervous that I was going to hate an album I once loved, or worse, find it tedious.